Alex Revell heaped misery on his former club as Leyton Orient knocked Swindon out of the Carling Cup. Jon-Paul McGovern gave Swindon a first-half lead and they nearly made it two but Charlie Austin could not convert. That signalled the start of Orient's revival and Ryan Jarvis beat the offside trap to draw the visitors level on 67 minutes. Ex-Robin Revell then took over, drilling a free-kick low into the net after Stephen Dawson had been fouled. "After being so much in control of the game and having so many chances to seal the game, I'm more than disappointed to tell you the truth. "I think the fact we haven't put it to bed is one problem but the other one is our defending at times. "They've had very few chances but they've scored goals too easily." 94:07 The referee gets the game started. 90:00+3:23 Defending throw-in by Elliot Omozusi (Leyton Orient). 90:00+1:59 Corner taken right-footed by Jon-Paul McGovern. 90:00+1:14 Outswinging corner taken right-footed by Stephen Dawson from the right by-line. 90:00+0:08 Corner taken by Stephen Dawson. 89:21 Attacking throw-in by Elliot Omozusi (Leyton Orient). 88:23 Substitution (Swindon) makes a substitution, with Simon Ferry coming on for Michael Rose. 87:40 Attacking throw-in by Elliot Omozusi (Leyton Orient). 86:20 Attacking throw-in by Elliot Omozusi (Leyton Orient). 84:48 Defending throw-in by Mike Cestor (Leyton Orient). 83:45 Free kick taken by Lecsinel Jean-Francois, Effort from deep inside the area by Jon-Paul McGovern misses to the right of the target. 83:45 Booking The referee books Mike Cestor for dissent. 83:21 Adam Chambers challenges Paul Caddis unfairly and gives away a free kick. 82:55 Attacking throw-in by Kevin Amankwaah (Swindon). 82:15 Substitution Adam Chambers joins the action as a substitute, replacing Dean Cox. 81:25 Attacking throw-in by Kevin Amankwaah (Swindon). 79:26 Corner taken by David Prutton from the right by-line played to the near post. 78:44 Kevin Amankwaah takes the chance to get an effort at goal. Jamie Jones gets a block in. 76:46 The assistant referee flags for offside against Scott McGleish. Scott Cuthbert takes the free kick. 75:57 Substitution Scott McGleish joins the action as a substitute, replacing Alex Revell. 74:53 Elliot Omozusi concedes a free kick for a foul on Lecsinel Jean-Francois. Phil Smith takes the free kick. 74:27 Corner taken by Dean Cox, clearance by Lecsinel Jean-Francois. 72:50 Substitution Ryan Jarvis leaves the field to be replaced by Jonathan Tehoue. 71:09 GOAL - Alex Revell:Swindon 1 - 2 Leyton Orient Alex Revell fires in a goal from just outside the penalty area to the bottom left corner of the goal. Swindon 1-2 Leyton Orient. 66:45 Substitution Alan O'Brien goes off and Kevin Amankwaah comes on. 66:45 Substitution Thomas Dossevi comes on in place of David Ball. 66:45 Elliot Omozusi provided the assist for the goal. 66:45 GOAL - Ryan Jarvis:Swindon 1 - 1 Leyton Orient Ryan Jarvis scores a goal from the edge of the penalty area to the top right corner of the goal. Swindon 1-1 Leyton Orient. 66:23 David Prutton has an effort at goal from the edge of the area that misses to the right of the target. 65:23 Goal kick taken long by Jamie Jones (Leyton Orient). 65:10 Effort from the edge of the area by David Ball goes wide of the left-hand post. 64:10 Defending throw-in by Mike Cestor (Leyton Orient). 63:52 Attacking throw-in by Paul Caddis (Swindon). 62:34 Corner from right by-line taken by Matthew Spring. 61:53 Attacking throw-in by Paul Caddis (Swindon). 61:35 Attacking throw-in by Paul Caddis (Swindon). 61:02 Attacking throw-in by Michael Rose (Swindon). 59:50 Outswinging corner taken by Ryan Jarvis. 58:41 Attacking throw-in by Alan O'Brien (Swindon). 57:34 Defending throw-in by Paul Caddis (Swindon). 57:20 Defending throw-in by Paul Caddis (Swindon). 56:41 Outswinging corner taken right-footed by Matthew Spring from the right by-line, David Prutton manages to make a clearance. 56:18 Effort from 18 yards by Alex Revell. Save made by Phil Smith. 55:37 Booking Jonathan Douglas goes into the book. 55:09 Stephen Dawson fouled by Jonathan Douglas, the ref awards a free kick. Jamie Jones restarts play with the free kick. 54:26 Goal kick taken long by Jamie Jones (Leyton Orient). 54:07 Effort from inside the area by David Ball misses to the right of the goal. 53:39 Goal kick taken short by Jamie Jones (Leyton Orient). 52:49 Outswinging corner taken by Jon-Paul McGovern, Effort on goal by Lecsinel Jean-Francois from just inside the box goes harmlessly over the target. 51:42 Ben Chorley gives away a free kick for an unfair challenge on Alan O'Brien. Jonathan Douglas restarts play with the free kick. 50:28 Goal kick taken long by Phil Smith (Swindon). 49:39 Defending throw-in by Elliot Omozusi (Leyton Orient). 49:28 Attacking throw-in by Michael Rose (Swindon). 48:25 Defending throw-in by Paul Caddis (Swindon). 48:19 Goal kick taken long by Jamie Jones (Leyton Orient). 48:09 Alan O'Brien sends in a cross. 47:35 Attacking throw-in by Jon-Paul McGovern (Swindon). 46:51 Goal kick taken long by Phil Smith (Swindon). 46:35 Defending throw-in by Mike Cestor (Leyton Orient). 45:00+1:35 Goal kick taken long by Jamie Jones (Leyton Orient). 45:00+1:19 David Prutton produces a drilled left-footed shot from deep inside the penalty box which goes wide of the left-hand post. 45:00+0:39 Goal kick taken long by Jamie Jones (Leyton Orient). 45:00+0:04 Corner taken by Matthew Spring from the left by-line, save by Phil Smith. 44:15 David Prutton takes a shot. Jamie Jones makes a save. 43:32 Defending throw-in by Elliot Omozusi (Leyton Orient). 41:41 Charlie Austin takes a shot. Save by Jamie Jones. 40:36 Jimmy Smith gives away a free kick for an unfair challenge on Charlie Austin. Jonathan Douglas restarts play with the free kick. 39:58 Attacking throw-in by Paul Caddis (Swindon). 39:17 Effort on goal by Paul Caddis from 18 yards. Save made by Jamie Jones. 37:53 Attacking throw-in by Elliot Omozusi (Leyton Orient). 35:55 Unfair challenge on Mike Cestor by Paul Caddis results in a free kick. Direct free kick taken by Matthew Spring. 34:14 Assist by David Ball. 34:14 GOAL - Jon-Paul McGovern:Swindon 1 - 0 Leyton Orient Jon-Paul McGovern finds the net with a goal from the edge of the area to the bottom left corner of the goal. 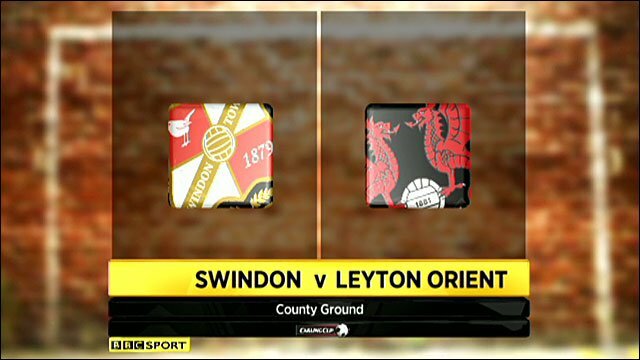 Swindon 1-0 Leyton Orient. 33:55 Attacking throw-in by Michael Rose (Swindon). 32:59 Unfair challenge on Alan O'Brien by Matthew Spring results in a free kick. Direct free kick taken by Phil Smith. 31:20 The assistant referee flags for offside against Alex Revell. Direct free kick taken by Phil Smith. 29:16 Attacking throw-in by Jon-Paul McGovern (Swindon). 28:53 Defending throw-in by Elliot Omozusi (Leyton Orient). 28:21 Attacking throw-in by Elliot Omozusi (Leyton Orient). 27:59 Defending throw-in by Elliot Omozusi (Leyton Orient). 26:29 Attacking throw-in by Paul Caddis (Swindon). 22:11 Attacking throw-in by Michael Rose (Swindon). 21:17 Corner taken right-footed by Matthew Spring from the right by-line, Scott Cuthbert makes a clearance. 20:34 Goal kick taken long by Jamie Jones (Leyton Orient). 20:24 Attacking throw-in by Paul Caddis (Swindon). 19:22 Defending throw-in by Michael Rose (Swindon). 17:02 Defending throw-in by Elliot Omozusi (Leyton Orient). 16:53 Attacking throw-in by Paul Caddis (Swindon). 15:01 Goal kick taken long by Jamie Jones (Leyton Orient). Correction - 14:17 Jon-Paul McGovern decides to take the corner short, Jamie Jones makes a save. 14:17 Corner from left by-line taken short right-footed by Jon-Paul McGovern (Swindon). 13:47 Goal kick taken long by Phil Smith (Swindon). 10:46 Goal kick taken long by Jamie Jones (Leyton Orient). 10:17 Attacking throw-in by Michael Rose (Swindon). 9:23 Stephen Dawson fouled by David Prutton, the ref awards a free kick. Stephen Dawson restarts play with the free kick. 7:45 Attacking throw-in by Jon-Paul McGovern (Swindon). 7:14 Defending throw-in by Michael Rose (Swindon). 6:58 Defending throw-in by Michael Rose (Swindon). 6:06 Defending throw-in by Mike Cestor (Leyton Orient). 5:28 Goal kick taken long by Phil Smith (Swindon). 5:10 Dean Cox produces a left-footed shot from the edge of the area and misses to the left of the target. 3:50 Goal kick taken long by Phil Smith (Swindon). 3:10 Jonathan Douglas challenges Stephen Dawson unfairly and gives away a free kick. Matthew Spring takes the free kick. 2:33 Corner taken right-footed by Jon-Paul McGovern, clearance by Stephen Dawson. 2:04 Outswinging corner taken by Jon-Paul McGovern from the left by-line. 1:31 Effort on goal by Michael Rose from just outside the area goes harmlessly over the target. 0:55 Defending throw-in by Elliot Omozusi (Leyton Orient). 0:39 Defending throw-in by Michael Rose (Swindon).